Established in 1950, under the support of the Ministry of Economic Affairs and National Cheng Kung University, Tainan Hydraulics Laboratory began with only a few teachers and students, then we began accepting research projects and recruiting more members, accumulating to more than 130 today, as well as professors, about 50 people today, thus solidifying the capacity of the Laboratory on large-scale hydraulic and ocean research. Relying on its own efforts, Tainan Hydraulics Laboratory has become one of the world-class hydraulic and ocean engineering professional research units, with a strong impact on the hydraulic and ocean engineering experimental research field in Taiwan. The National Museum of Taiwan Literature (NMTL), founded on October 17th,2003, is the first national museum dedicated to the literary arts. The museum building has a distinguished history tracing back to 1916,when it was built to house the Tainan Prefectural Government. Reflecting contemporary European architectural styling, it is one of several well-known works by architect Moriyama Matsunosuke on the island. Other Matsunosuke projects include the current Office of the President (Sotokufu) and Control Yuan in Taipei. The building was damaged during WWII and suffered decades of neglect before serious restoration work was commenced in 1997. Reopened in 2003, the building is today afocal point of island literature,culture, architecture and history, and a successful example of both restoration and revitalization. The NMTL records, organizes and explains Taiwan's literary heritage. Archives and displays include examples from indigenous Malayo-Polynesian cultures as well as from key periods in Taiwan history – from the Dutch, Ming / Koxinga,Qing and Japanese periods through modern times. Educational activities promote awareness of Taiwan literary traditions. The museum includes literature and children's literature reading rooms as well as a literary experience center designed to both excite and educate. In helping spread literary knowledge and appreciation, the museum hopes to make reading and the literary arts a 「friend」 for life. Confucius Temple was the look after reconstructing during the time when Japanese were ruling (1917), its elegant and simple localization characteristic takes a distinctive attitude of its own among the Confucius Temples buildings in Taiwan. There are fifteen structures inside the Confucius Temple, the primary sacrifices in the palace is to Confucius divine tablet, on both sides, the sacrifices are to the sixteen pupils of Confucius. Between the beams and pillars, there hang twelve horizontal described boards awarded by sovereigns of all dynasties since early Manchu Dynasty till today, it is the Confucius Temple in Taiwan to own the most complete royal horizontal described boards of all dynasties. Inside the temple, there are very old trees towering, classical elegant and tranquil, self-becoming a place of its own, the whole space presents a cultural breath, and is presently ranked among the national first-degree historic spots. Speaking of the preservation of the cultural articles in the Confucius, the inscriptional records through all times of repairs, the horizontal described boards awarded by sovereigns of all dynasties, and ceremony and musical instruments from early Manchu Dynasty till nowadays are still kept perfectly, and these are all very precious historical cultural articles that deserve to be carefully appreciated. Tainan Chikan Tower（Chihkanlou）is built by the Dutch in 1652. It was originally called Provintia. In Dutch it means eternity. The Chinese called the building "Chikanlou（Chihkanlou）", "Fanzailou" or "Honmaolou". Although Chikanlou（Chihkanlou） has gone through Ming Dynasty, Qing Dynasty and the Japanese Colonization Period, it basically still maintains its original look. This temple, along with the Confucius Temple, is known as one of the oldest and best-preserved temples in Taiwan. Just when it was originally built is not known, but according to legend it was during the Ming dynasty's Yungli reign, in the mid-17th century. During the Qing dynasty, this was where government officials offered sacrifices to the god. mortal origin was as a general of the late Han dynasty (early 3rd century) who, because of his behavior, becomes a symbol of uprightness and loyalty to later generations and was finally deified. He is said to have been good at managing finances and to have invented a method of accounting, and so is also worshipped (by businessmen, especially) as the God of Commerce. The entrance to this temple has a particularly high threshold, and for a reason. In the old days, it is said, women were banned from the temple and the high threshold was designed to keep them out. Datianhou Temple (Taina Grand Matsu Temple) is commonly known as a Mazu Temple of Tainan- the first Mazu Temple built by the government in Taiwan. The god worshipped in Datianhou Temple(Taina Grand Matsu Temple) is The Heaven God Mother, or widely called Mother Mazu, the most worshipped god in the Taiwanese society. The Datianhou Temple (Taina Grand Matsu Temple) was originally the palace of Emperor Ningjing of the Ming Dynasty. In the 22nd year of Emperor Kang Si (in 1684), after admiral Hsih Long had occupied Taiwan, he found that Mazu was mostly worshipped by the Taiwanese people and as a way to easy their hard feeling towards foreign rule, he then reported to the emperor and requested to have the Ningjing Palace rebuilt into a Mazu Temple and promoted Mazhu to Tianhou, meaning the Heaven God Mother. 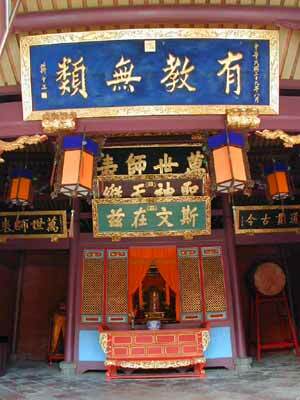 Since then the Mazu temple is called Datianhou Temple (Taina Grand Matsu Temple). Datianhou Temple (Taina Grand Matsu Temple) can be divided into 4 main parts : the San Chuan Hall, the Worship Hall, the Main Hall and the Back Hall. The lively large sized Mazu statue is the main feature of the Temple. It was the master piece of a sculptor from Chuan Chou about 300 years ago and is the representative work of Taiwan's sculpturing of its kind. In 1624, Dutch built the first fort in Anping, Taiwan, called "Fort Zeelandia", now known as Anping Fort, where has been the administrative center of the Dutch regime, and the hub for trading. The building was originally constructed in square inner fortress and rectangle outer walls. In 1661, the fort was renamed as Anping to commemorate his home town when Guoxingye (Cheng Cheng-Kung) has driven the Dutch out of Taiwan. 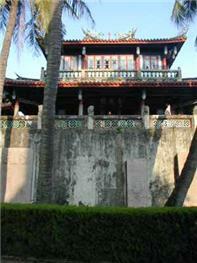 Therefore, Fort Zeelandia was also known as "King's Fort" or "Taiwan Fort", nicknamed Anping Fort. 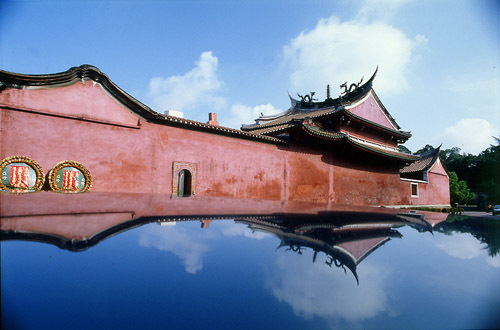 In Kangxi Emperor's regime of Qing Dynasty, Taiwan was included in the empire that the political center was transferred to Tainan City, causing the decline of the Fort. The red bricks of the Fort have been taken for construction of Eternal Fortress. During the Japanese occupation, the Dutch style buildings in inner fortress were completely destroyed. A square red-bricked step platform was constructed with a western style house on the platform, being served as dormitory for Customs officials, where the memorial hall now is located. It was named Anping Fort after Restoration of Taiwan, and was registered to be the first grade historical replica and become an attraction for tourists. The remaining more than 70 meters long south walls of the outer fort with worn-out red bricks, accompanied by the old banyan roots, chanted its odyssey. 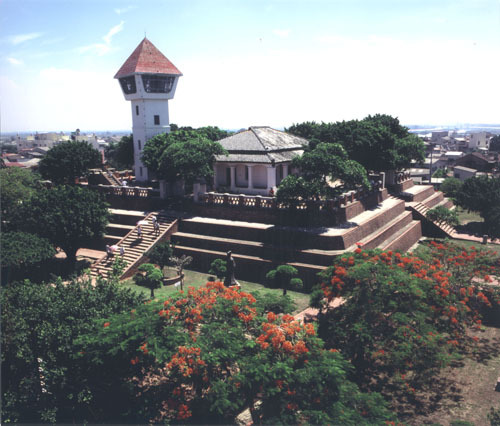 The fort is the very historical replica over three hundred years. Adjacent to the Tait & Co., it was one the warehouse of Tait & Co. in the beginning. Considering the bricks were gotten from Anping Fort for the construction of this house, it might be built between the end of 19 century and the beginning of Japanese colonization. To be a warehouse of Japanese salt company. What you see now should have been re-constructed by Japanese. After the restoration of Taiwan, it was become the warehouse of Taiwan Salt Corp.. It was fallen into disuse and the pagoda trees grown in there. Over half century, it formed a special scene with trees wind around the house. Because of this special scene, artists stopped here for some art activities. But without supported by government, it was terminated. Until Tainan Government want to carry out the National Anping Harbor Historic Park Project, it was then included into this project. After repaired in 2004, one can cross this tree house now by the wooden path with a childlike image to discover this funny space. Zengwen River, Luermen River, and Yanshui River. Also within its 4,905-hectares of land area are the Black-faced Spoonbill Refuge and Qigu Wetlands. The coastal alluvial terrain, old shipping channels and traditional industries further add to the natural and cultural allures of the park. The sea areas of the park extend over 39,310 hectares and include one of the main sailing routes—Dongji Islet to Luermen—used by early Han settlers from the mainland. The majority of this region has long been known as "Taijiang," giving the park its name. Visitors can also explore mangrove forests, wetlands and other ecological and scenic attractions at this emerald Eden on Taiwan's southwest coast. The story began in 1895 with a fisherman with the surname Hong whose family migrated to Fucheng from China's Zhangzhou. He made a living catching fish. The sea is usually very rough between the Tomb-sweeping Festival and the Mid-Autumn Festival each year so this became known as the "Slack Season" because the fishermen couldn't go out to sea. To make a living during the slack season, Hong began selling noodles. His noodles had a unique taste and were quite popular so he eventually began selling them full-time. In the beginning, he carried his noodles on shoulder poles and sold them in the streets, so he named it "Slack Season Tan Tsai Noodles"